In December, Synology introduced a new member of its high end xs/xs+ NAS family, the DS2015xs. What sets this product apart is the processor, an ARM-based Annapurna Labs Alpine AL-514. One of the advantages of the AL-514 is built-in MAC support for two 10GbE ports. This enables the DS2015xs to have two built-in 10GbE SPF+ ports without the cost of an add-in PCIe board like Thecus and QNAP use. SPF+ ports do require special cables with SPF+ modules on each end. But these can be had reasonably for around $25. I'll be comparing the DS2015xs with the recently reviewed QNAP TVS-471-i3-4G. Both were tested using both our traditional Gigabit tests as well as 10GbE. In an interesting article, anandtech.com stated, "... the Cortex A15 really can't stand up to the Core i3 (on which the previous generation xs units have been based) in terms of raw CPU performance. There is no support for ECC RAM either. 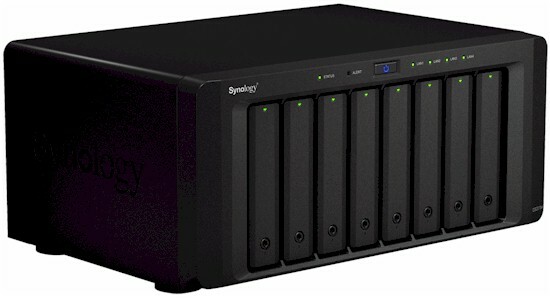 Synology clarified that the CPU performance would definitely not match up." We'll see later if that holds true. The callouts below show the front and rear panels. The front panel has LED indicators for status and alerts (left set of LEDs), LAN activity indicators (right set of LEDs) and individual indicators for each drive on the drive tray. Each of the drive trays is lockable. Note, however, there isn't an LCD status display. The rear panel has two Gigabit Ethernet ports, two USB 3.0 ports and two 10GbE SPF+ ports. As you can tell from the power connector, the power supply is built into the DS2015. Just below the Gigabit Ethernet ports is an Expansion port that can be used to connect to Synology's DX1215 12-Bay expansion unit. The photo below shows the main board with 4 GB of DDR3 memory mounted just above the heat sink, which covers the AL514 processor. In the upper right corner, you'll see the two 10 GbE SPF+ ports. Following down the right side, note the two Gigabit Ethernet ports and Infiniband expansion port. The image below shows the DS2015 with the case removed and the bottom of the board exposed. Note the empty DIMM memory slot for memory expansion. An additional 4 GB can be added bring the total to 8 GB - the maximum amount of memory supported. The next image is similar to the one above, but the case has been turned to show the internal power supply. The DS2015 is cooled by two 120mm fans. The board below is used to connect to the fans and USB 3.0 ports. The two eSATA ports at each end of the board aren't functional, so aren't brought out on the rear panel. They're there because this board is used in other products. The QNAP TVS-471 was difficult to disassemble, so we weren't able to extract individual component part numbers as we normally do. However, I've taken what information that we were able to determine for key components and include it in the component summary comparison table below. Intel WG1210AT (x2) Intel WGI210TA (x2) ? Etron Tech EJ168A (on smaller board behind backplane) ? Marvell 88SE9235-NAA2 4 port PCIe to SATA Controller ? Power consumption with four SNB-provided WD Red 3TB (WD30EFRX) drives was 35W (active) and 19W (power save). RAID 10 rebuild time was about 1 hour without a bad block check for a 4 X 3TB configuration. The RAID 10 rebuild also took about 1 hour without a bad block check. Fan and drive noise was rated low. It took multiple attempts to make an iSCSI connection when connected via Gigabit Ethernet. The Windows initiator would discover the target, but would appear to hang when trying to connect. It eventually connected when left alone. The iSCSI target connected immediately via 10GbE. Synology supplied an Intel X520-DA2 1-GbE SPF+ NIC with cables for 10GbE testing, since our standard 10GbE NIC is Intel's 10GBaseT (copper) version.